As part of our current campaign focussing on materials from hybrid ("mixed") jurisdictions, the TransLex-Team has just uploaded relevant sections of the Code Civil of Louisiana. More materials will follow soon. The introductory text on the historical and New Lex Mercatoria has been revised, especially with respect to the historical roots of the Lex Mercatoria concept in the area of both maritime and general commercial law. Our online archive of rare historic documents on arbitration and ADR now has the final settlement agreement of 27 April 2006 of the dispute between the Swiss Cantons of Zurich and Saint-Gall regarding cultural goods transferred from Saint-Gall to Zurich during the Battles of Villmergen of 1712. The Trans-Lex Team wishes everybody a happy holiday season and a healthy and successful year 2019! TransLex now contains three important OHADA documents: The Uniform act relating to general commercial law, the Uniform act on Arbitration and the preliminary draft by Professor Marcel Fontaine of the Uniform Act on Contract Law. Bin Cheng's seminal study of 1953 on "General Principles of Law as applied by International Courts and Tribunals" has been continued by Charles T. Kotuby and Luke A. Sobota in their excellent book on "General Principles of Law and International Due Process: Principles and Norms Applicable in Transnational Disputes", Oxford 2017. 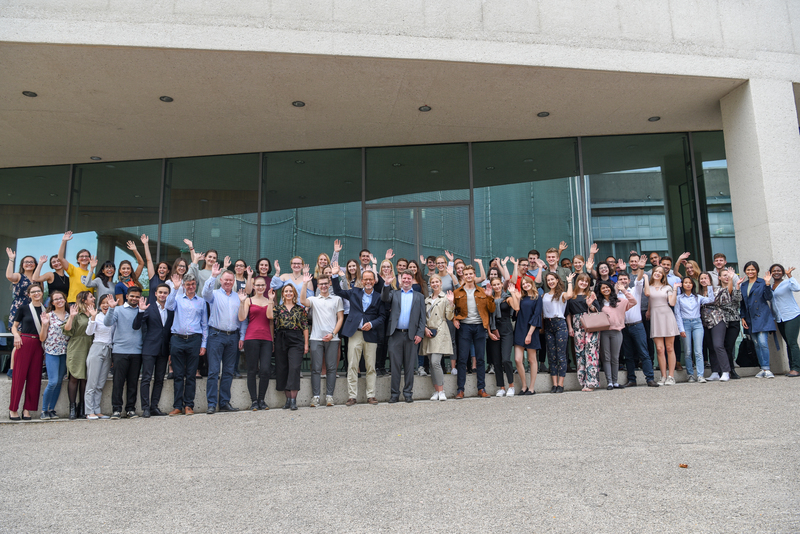 It was great to have 65 participants from 24 countries with us here at Cologne University for our annual Cologne Summer Academies on International Business Negotiation, Mediation and Commercial Arbitration. For more information on the Cologne Academies, please klick here. In Part IX. (Historic Awards/Materials) of the "Materials" Section you now find rare historic documents and explanations on the involvement of the Venetian nobleman and diplomat Alvise Contarini as one of the two mediators who assisted in the negotiations leading to the Westphalian Peace Treaties of 1648. If you are interested in the history of international arbitration and mediation, you will find two new Scottish documents from 1418 and 1609 in Part IX. (Historic Awards/Materials) of the "Materials" Section. The Trans-Lex Team wishes everybody a happy holiday season and a healthy and successful year 2018! Ulf Krause, long-time member of the TransLex team and co-head of our IT, has his last day in office today and will pursue a career in private practice. Many thanks for all the ideas, innovations and excellent work, and all the best for his future career! The English translation of the new provisions of the French Code Civil created by Ordonnance n° 2016-131 of 10 February 2016 is now available in our Materials-Section. A true milestone in the research on the New Lex Mercatoria has been published: Orsolya Toth, The Lex Mercatoria in Theory and Practice, 2017 (OUP). The fourth edition of the TransLex-Booklet, which contains the text of the TransLex-Principles with Commentaries, has just been published. Please do not hesitate to contact us for your free copy. The Section on historic arbitration Materials now contains an account of the arbitration provision in the "Great Peace of Montreal" of August 4, 1701, including a pdf of the original text of the Treaty, which was kindly provided to us by the "Archives nationales d'outre-mer" in Aix-en-Provence, France. Trans-Lex has a new, faster, and enhanced search engine. It offers a set of specific operators and filters that help you refining your search. For more information please refer to our "how to search"-page. Trans-Lex.org is a Supporting Organization of the V ICC Lex Mercatoria International Commercial Arbitration Moot (English Chapter) to be held in Minsk, Belarus from 25-28 November 2016. More information on the Moot may be accessed here. For immediate access to TransLex in an App-like way, simply add a bookmark with the TransLex-Icon to the home screen of your mobile phone. To learn how to do it, please refer to these tutorials for iOS and Android. In the interest of enhanced user-friendliness, TransLex has been optimized to a responsive design. The website will adapt automatically to all screen sizes, including smartphones and tablets. The contributions of Yildirim, Ayoglu, Marrella, Connerty, Eskiyörük and Osman from the Conference Proceedings „International Commercial Arbitration and The New Lex Mercatoria” (Yildirim/Eskiyörük eds 2014) are now available with permission as full text pdfs in the TransLex Bibliography. A new feature was added to further increase the userfriendliness of the full-text or semi full-text comparative law references for the TransLex-Principles: when the cursor is moved over a “post-it” which indicates that the relevant passage of the document is used as a reference for one of the TransLex-Principles, a window opens and shows the full text of the relevant TransLex-Principle. To further enhance the userfriendliness of the TransLex Principles, the text of footnotes in the comparative law references for each Translex Principle can now be read by moving the cursor to the footnote number in the text. The third, fully revised edition of Professor Berger’s successful multimedia project on ADR in international business (negotiation, mediation, arbitration) has just been published. Click here for a video interview on the new edition. The TransLex Website and its „very exhaustive list of 130 general principles of the New Lex Mercatoria” is mentioned in the ICC’s recent study on “Developing Neutral Legal Standards for International Contracts”. A new Principle was included in the TransLex-Principles relating to the severability of contract provisions. That Principles reflects a standard practice in the drafting of international business contracts. The famous (and lengthy!) dissent by Sir Alexander Cockburn of September 14, 1872 in the Alabama Claims Arbitration is now available in the Materials Section. A very special thank you goes to TransLex Team-Member Jakob Fleischmann for his unprecedented one-year-effort to prepare this text for inclusion in TransLex! The idea of a new world order of economic relations based on, among other things, the organization of transnational communities and markets, the architecture and content of modern transnational contracts and transactions, as well as the transnationalization of international business law and arbitral case law was discussed at the Beaune Meeting of the ICC International Court of Arbitration in September 2014. Professor Felix Dasser has reviewed the concept of the Creeping Codification and its relationship with TransLex in Rabels Zeitschrift (RabelsZ) 2013 at page 449 et seq. TransLex 3.0 was launched today. It’s more user-friendly than ever before and has a super fast search engine. TransLex 3.0 will be presented at the final rounds of the Vis Moot in Vienna! In February 2014 Professor Berger has presented the Beta-Version of Trans-Lex 3.0 in his lectures on "Transnational Commercial Law & International Arbitration" at Columbia Law School, New York. A new and long-awaited category of references has been opened for the TransLex-Principles. Under “Contract Clauses” you find a collection of contract provisions which reflect the fact that the relevant Principle is being used in international contract practice. So far, the new category has been opened for more than half of the Principles. The TransLex-Team will constantly expand this new category. New and rare historic documents on arbitration have been included in the “Materials” Section, such as Aristotle’s view on arbitration of 329 B.C., King Solomon’s Judgement from the Bible, the Scottish Arbitration Act of 1426, the arbitration clause in George Washington’s last will of 1799 and William Blackstone’s commentary on arbitration of 1809. Trans-Lex Commentaries are now available for more than 120 Trans-Lex Principles. In order to enhance the userfriendliness of TransLex, the TransLex-Team has added Commentaries to a number of Principles such as Hardship, Force Majeure and Bribery. When reading the CISG at Trans-Lex (http://www.trans-lex.org/500100) you can click on article-specific links which refer you to the corresponding website of the Pace Database. A contribution on TransLex by Professor Berger was published in the Liber Amicorum for Professor Eric Bergsten. TransLex' Principle on Force Majeure was cited by AOL-News in relation to the current Lybia crisis. Trans-Lex.org now indicates at the bottom of every document where this doc is cited by another Trans-Lex.org document. Prof. Berger gave an interview on Transnational Law and Trans-Lex.org to PACE University. Creeping Codification, 2nd ed. out now: Click here to order. TransLex is the runner up in OGEMID's of the Year Awards 2009 in the category "IDR-Related Project". A new Section with research papers on transnational law under "VII." is opened in the TransLex-Materials. Now every document has a facebook link at the bottom which allows you to share TransLex documents in Facebook. A new Section with Historic Materials was opened under "VI" in the TransLex-Materials. TransLex was presented at the final rounds of the Willem C. Vis Moot Court in Vienna. Many thanks for all the encouragement!